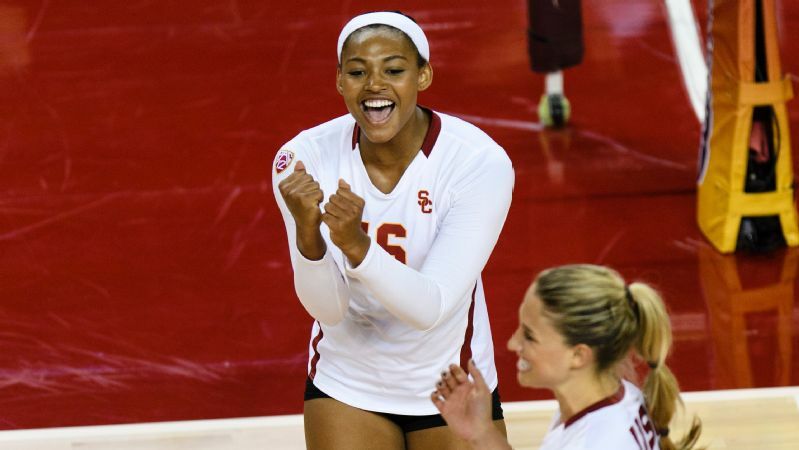 After an 18-13 regular season, freshman Khalia Lanier looks to lead USC on a long postseason run. Khalia Lanier wouldn't be denied. Flying around the court for USC -- up 23-20 in the third set of a back-and-forth game against No. 8 UCLA last Saturday -- the freshman outside hitter knew she needed to make a play. Wearing her customary yellow headband, the 6-foot-2 Lanier rose up as if she had springs in her sneakers, and smacked the ball down with such grace that the kill was as sublime as it was powerful. 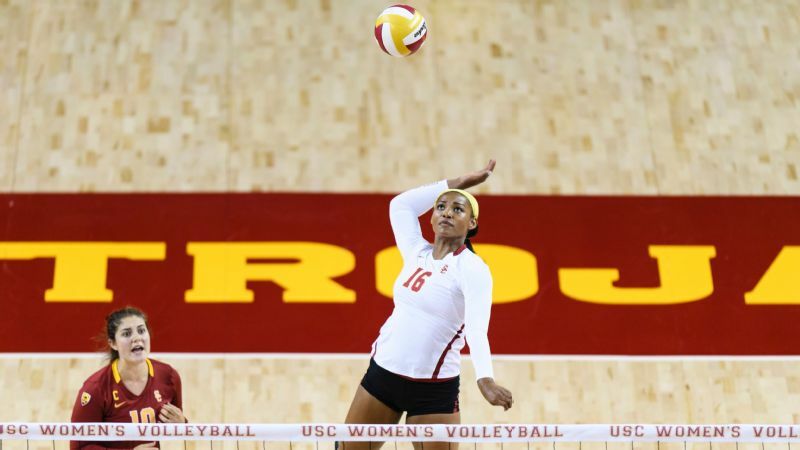 "Khalia walks on the court and she just allows everybody else to know that there's a go-to player, that if we get in trouble, we can give her the ball and she will do it," said USC coach Mick Haley, whose Trojans (18-13) eventually lost the five-set thriller. Lanier had 26 kills on a career-high 71 attacks, 10 digs, two service aces and a block. 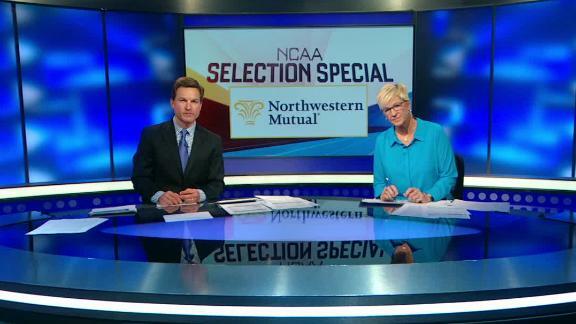 Two days later, she was one of two freshmen named to the All-Pac-12 team. The 2020 Olympics aren't out of reach. "What she doesn't get is she has this tremendous ability to lead a team," Haley said. "She's the real deal." Since she was a kid, teammates have always looked to Khaila Lanier to provide the big kill or say the right words in a team huddle. Every bone in 13-year-old Khalia Lanier's body threatened to snap. Before practice for her club team in Scottsdale, Arizona -- a team that seemed allergic to winning -- Lanier's teammate, smiling and giggling, bragged about a hair bow she made in school earlier that day. "I can't believe that we have not won ONE game," Lanier exploded. "And you're talking about a BOW that you made in school!" Her coach blew the whistle. "Khalia, get out." "We go home, and I said, 'That's not your job. That's what the coach says,' " said Lanier's mother, Rose Lanier, who made her daughter apologize to the team. "She'll do everything she can to win," Rose said. "She'll figure it out." 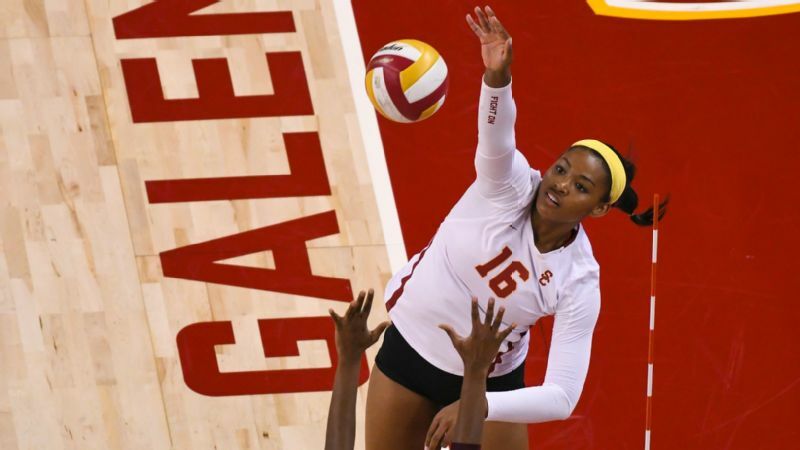 Lanier, the 2016 Gatorade national volleyball player of the year, a two-time club national champion and a one-time high school state champion, couldn't have predicted USC would barely squeak into the NCAA tournament. Nobody could have. The Trojans (18-13), who finished in a tie for seventh in the Pac-12, will face Hawaii (22-5) in the first round Friday. 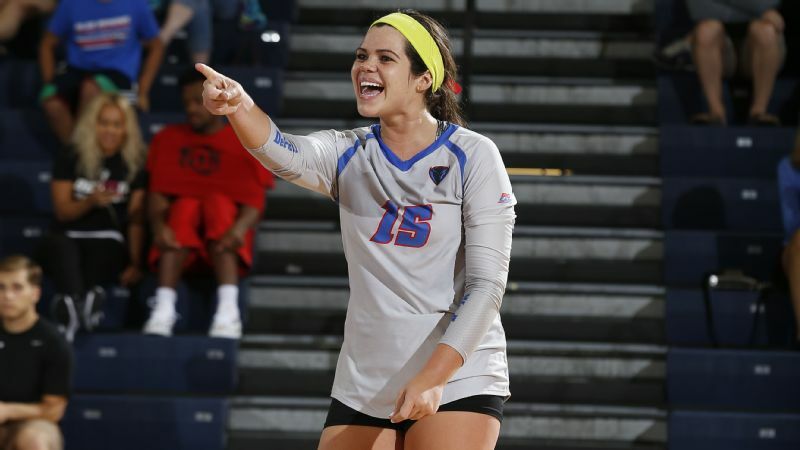 As the replacement for All-American Samantha Bricio, Lanier had been tabbed to help the team forget its shocking 2015 loss to Kansas in the regional final as the No. 1 seed. Without a seed this year, the Trojans enter the tournament in a far different place. 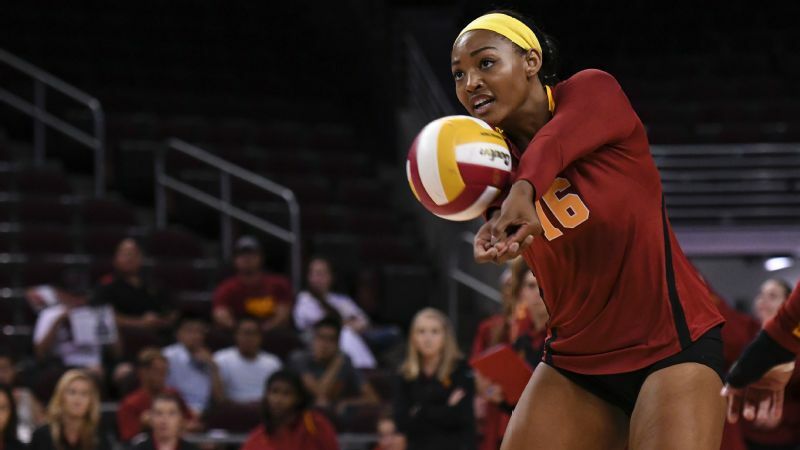 Lanier, the only freshman to rank among the top 10 in the Pac-12 in kills (4.01) and points per set (4.44), has taken each loss personally -- USC closed the season with three consecutive defeats. "When we've had some 'Come to Jesus' meetings," Haley said, "she's not been afraid to stand up and identify what she thinks is a problem and how we might solve it, and that's garnered a lot of respect from a lot of the older players." But even as Lanier has racked up 15 double-doubles, including a career-high 27 kills and 12 digs against Washington State last week, she often feels she's not contributing enough. 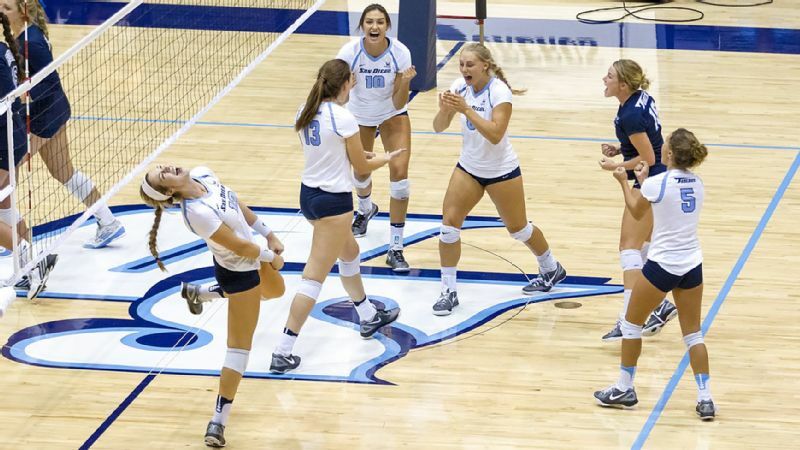 "She can have 25 kills in a game," freshman opposite Daley Krage said, "but then be like, 'Wow. Those three errors I made really hurt the team. I can't make those again.' "
Nobody is as tough on Lanier as she is on herself. "My coaches try to tell me, 'Khalia, you're just a freshman and you're doing so well,' " said Lanier, who requests scouting reports not just on opponents, but on herself, "and I'm the one that's always pushing myself to achieve more." This is the part of Lanier that builds her up and brings her down -- and only she knows how to harness that power. Khalia Lanier had 15 double-doubles this season. For her, it was nowhere near enough. The 18-year-old Lanier has always had big shoes to fill, because before Samantha Bricio there was Bob Lanier. Her father, the former Detroit Piston, the NBA Hall of Famer. As expectations stuck to her like Velcro, Lanier dominated all-boys basketball leagues. Once, 11-year-old Lanier begged her father to rebound for her so she could watch the ball swim through the net. "All you want to do is shoot. That's not what basketball's about. It's about drills," said Bob, eye to eye with his daughter, who had sprouted to 6 feet. "Do you really want this?" Knowing she didn't have that deep-down love for hoops -- the kind that tugs at you at night -- she softened the moment: "You know what? I think I want to be a cheerleader." The Pac-12 had a topsy-turvy feel to it this season. So how do we rate the eight Pac-12 teams in the NCAA tournament? 1. Stanford: At their best, the Cardinal are final-four caliber; at their worst, they could lose early like last year. 2. Washington: The Pac-12 champs' biggest obstacle is they're in what seems to be the toughest region. 3. UCLA: Could meet San Diego, whom Bruins lost to in September, in the second round. If they get past that, the regional final is a real possibility. 4. Oregon: If the Ducks can make the regional semifinals, they could potentially challenge Kansas. 5. Washington State: The ultimate roller-coaster, are the Cougars set for a postseason upswing? 6. Arizona: Beat Stanford (once) and UCLA (twice), but the Wildcats are in the same tough region as Washington. 7. Utah: Dropped three in a row to end the regular season, but don't rule out a postseason run. 8. USC: After losing their final three, the Trojans may relish their rare "underdog" status. What she really wanted was to make a name for herself -- out of the spotlight. She excelled at gymnastics but was told she was too tall. She had great coordination in soccer but didn't pursue it. She liked softball, but it was too slow. Following her sister, she fell in love with volleyball, but the microscope remained. Even as a seventh-grader, when Haley first saw her, she commanded attention. "When she jumped? She just kept going up," Haley said. By 13, Lanier joined Arizona Storm VBC under coach Terri Spann, a team that trained 10 hours a week. Struggling with push-ups and once benched for forgetting sneakers, Lanier wanted to quit. But she kept coming back, surpassing each challenge. Once, Spann's brother-in-law, former NFL player Toby Wright, asked Lanier to push his blue and white Hummer across the parking lot while he sat inside. "She could push that Hummer all on her own," Spann said. "Khalia wanted to be the best." But when she felt she was falling short of that goal, she berated herself. The fear followed her to the classroom, convinced she'd fail despite earning straight A's. Lanier morphed into the nation's No. 1 recruit but sometimes suffered mental breakdowns and struggled shaking off mistakes. "It was such a roller coaster, trying to overcome the people who are on the other side of the net, as well as the thoughts that were in my head," Lanier said, "just constantly feeding myself negative feelings about giving up was just so unhealthy." Rose, who had driven enough miles to practices and games to understand her daughter's silence as a language of its own, sensed something was wrong one day. "I don't want to play anymore," Khalia said. "I'm done." She was tired of being depended on for the epic kill or the right words in huddles, exhausted from club, high school and international commitments. She wanted to be a normal kid. The next day, Lanier asked her mom for her bag. "I have practice," Khalia said, smiling. "I'm OK."
"Khalia's not one to give up," Rose said. "She goes through a lot, but she won't give up on anything." Khalia Lanier has dealt with pressure since she was a kid. Now she's learning to embrace it. A light crept under Lanier's bedroom around 3 a.m., the morning of a state semifinal against Horizon, a team Lanier's Xavier College Preparatory squad hadn't beaten the previous four meetings. "Khalia, what are you doing?" Rose asked. "I'm watching film. I've figured it out, Mom." When she jumped? She just kept going up. Lanier, then a sophomore, dominated and led her team to victory in four. Moving on to the finals against Hamilton, she posted 10 kills in the fifth set to give her team the win. "She took over," Xavier coach Lamar-Renee Bryant said. "I think she got it: 'OK, I can lead, no matter what. I can lead with my play. I can lead with my voice. I can lead with my mind.' "
Now at USC, counted on to lead more than ever, Lanier has learned to befriend the harsh voice inside her head -- to use it as an ally, a secret power. Against Stanford in October, facing a block of two players taller than 6-6 for the first time, she felt herself falling short. "I had a mental breakdown," said Lanier, who had 11 kills and five digs. She devoured the game film for hours. Putting her team on her back, Lanier rose to the physicality of the blocks in the next meeting against the Cardinal in November, posting 18 kills and 12 digs. "I didn't play perfect, but I played better than I did the first time," Lanier said. "As I've gotten older I think I've tried to not put as much pressure on myself for messing up. You just have to move onto the next play."